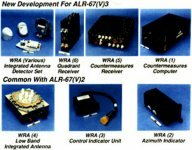 The AN/ALR-67(V)3 Advanced Special Receiver is a radar warning receiver (RWR) designed to meet Navy requirements through the year 2020. 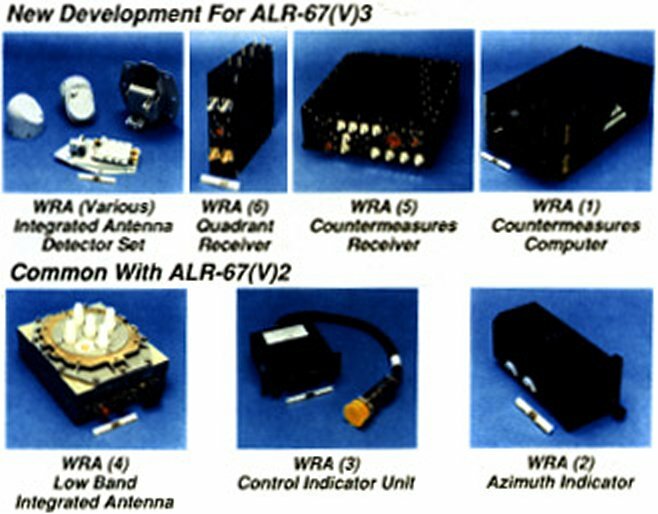 This is an upgrade to the ALR-67 (V)2 system currently used on F/A-18 Hornet, F-14 Tomcat, and AV-8 Harrier aircraft. It will enable Navy and Marine Corps tactical aircraft to detect threat radar emissions, thus enhancing aircrew situational awareness and aircraft survivability. The program is in the Engineering and Manufacturing Development (EMD) phase, with development work by Hughes, Los Angeles, CA. The AN/ALR-67(v)3 ASR contributes to full-dimensional protection by improving individual aircraft probability of survival through improved aircrew situational awareness of the radar guided threat environment. The ASR is a radar warning receiver (RWR) intended to supersede the AN/ALR-67E(v)2 [formerly AN/ALR-67(v)2 (ECP-510)] with extended capabilities in detection and processing of air defense threat radars of the mid 1990 and beyond time period. It functions cooperatively with the onboard suppression and defensive systems (high-speed anti-radiation missile (HARM), countermeasure dispensers, and RF jammer) via data exchanged over the EW multiplex bus and the HARM data bus. The (v)3 ASR is applicable to the F/A-18C/D/E/F, while the (v)4 ASR will be applicable to the F-14A/B upgrade, F-14D, and AV-8B (when / if funded). The (v)3 ASR differs from (v)4 only in the housing of one Weapon Replaceable Assembly (WRA-V) which was split into two portions to alleviate structural limitations in the F/A-18 tail. Except for WRA-V, new brackets required for antennas and additional wiring, the bulk of ASR hardware is a form and fit replacement for AN/ALR-67E(v)2 hardware. The ASR provides an order of magnitude increase in processing power. 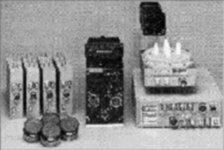 The ASR collection categories include: high band pulse (2-40 GHz); high band continuous wave; low band pulse (less than 2 GHz); and millimeter wave MMW (28-40 GHz). The ASR provides signal detection, direction finding, and identification of radio frequency (RF) and MMW threat emitters including: scanning, pulse Doppler and continuous wave tracking, acquisition and early warning radars, and missile guidance. The Low Band Integrated Array in the ASR was not changed from the ALR-67E(v)2. The software reprogrammable threat library user data file (UDF) development and maintenance process and infrastructure for the ASR is intended to support improved operational timeliness of UDF updates (i.e. : tactical reprogramming). The ASR is a Navy program which achieved Milestone-II in 2QFY87. At the present time the (v)3 ASR program for the F/A-18 is planned and funded to proceed through OPEVAL to Milestone-III. Congressional concern over the Navy acquisition strategy for the ASR resulted in two special reporting requirements. The first was met when an EOA by COMOPTEVFOR in October 1994 following DT-IIB, and the December 1994 DOT&E-approved TEMP No. 521-1 Revision A, helped to support a required USD (A&T) March 17, 1995 report on the soundness of the ASR acquisition strategy. House National Security Committee Report (H.R. 104-131) acknowledged the USD (A&T) report and stated that should the test results remain positive, the DoD is encouraged to accelerate the acquisition and fielding of the system in order to correct deficiencies in the fleet at the earliest time possible. The second special requirement was for a pre-LRIP report. H.R. 4560 S. Rep. 103-747, Section 8050, states that none of the funds made available to the DoD during FY95 may be obligated for LRIP of the ALR-67(v)3 ASR until 30 days after the congressional defense committees have received the following. (1) A certification by the DOT&E that based on the result of the Joint Development Test/Operational Test (JDT/OT) flight tests and of the OA intended to address the readiness of the ASR for LRIP, ASR is potentially operationally effective and potentially operationally suitable and ready to enter LRIP; (2) A comprehensive report by the COMOPTEVFOR, Navy, as to the test objectives and results of the JDT/OT test flights and of the OA intended to address the readiness of the ASR for LRIP; and (3) A comprehensive report by the Assistant Secretary of the Navy (Research, Development and Acquisition) as to the test objectives and results of the Developmental Flight Tests and Technical Evaluation, along with certification that, based on these results, the ASR is ready to enter LRIP. During FY96 DOT&E staff and support analysts participated with the program's Test Planning Working Group and observed ASR test events. DOT&E approved operational test plans for the combined DT/OT which began 2QFY96 with installed system test facility (ISTF) testing at the Patuxent River, MD, Air Combat Environment Test and Evaluation Facility (ACETEF). Late delivery of ASR test hardware sets delayed the start of the combined DT/OT by nearly three months. The 2QFY96 combined DT/OT testing at ACETEF was curtailed by the operational test director due to immaturity of the ASR system and its integration in the F/A-18C/D. Despite this outcome, a distinct benefit of that early OT involvement was the valuable insight gained by the project team well before the OPEVAL. The Navy restructured the ASR program with an eighteen month schedule extension. An extensive DT with OT Assist was begun which consisted of several complementary/parallel test events/flights conducted by the operational test director, with OT aircraft, at China Lake. These events were planned to support a Navy decision regarding the selection of the ASR for the initial avionics baseline in the F/A-18E/F and Integrated Defensive Electronic CountreMeasures (IDECM) programs. The program deployed the ASR to NATO Exercise Trial Mace IX in early 1QFY98. This DT with OT Assist provided an opportunity to validate ASR performance in an instrumented open air environment against some blue/gray emitters which are not available in the U.S. T&E infrastructure except as hardware in the loop (HITL) or ISTF simulations. Prior to deploying, the test plan scenarios were run in HITL tests to baseline expected performance. Digital bus recorders instrumented the operational VX-9 aircraft for post mission analysis of the RWR performance relative to the threat site activity data reported from the exercise systems on the range. Immediately upon return from Trial Mace, a Navy Operational Test Readiness Review, determined readiness for combined DT/OT (OT-IIA) which began 1QFY98. The OT-IIA concept and OTP were briefed to the Deputy DOT&E for Conventional Systems in September 1997, and approval is anticipated upon final OTP submission. The DOT&E staff have supported the Test Planning Working Group effort to complete a coordinated update to the DOT&E approved Milestone II TEMP, which will reflect the program changes. DOT&E reviewed the TEMP update for approval upon submission. Submission of the special "pre-LRIP reports" followed completion of OT-IIA prior to LRIP. As an acquisition reform initiative, the Navy milestone decision authority, Program Executive Officer-Tactical Aircraft (PEO-T) conducted the Milestone-III review in late 2QFY98, while reviewing OT-IIA results and making the LRIP decision. Exit criteria for the planned 2QFY99 full rate production were be set at this time. The OT-IIB (OPEVAL) began 3QFY98 and completed 1QFY99. DOT&E intends to produce a BLRIP report supporting the full rate production decision in 2QFY99. As a direct result of poor system performance in the early combined DT/OT, conducted in the ACETEF ISTF at the urging of DOT&E, the OT was halted and the program was restructured in 2QFY96. Subsequent DT and DT Assist by COMOPTEVFOR/VX-9 operational pilots, has clearly indicated that system effectiveness and suitability have improved in the past eighteen months. Software maturity/stability was questionable at the mid-1QFY98 re-start of IOT&E. This was due to the many software changes (deficiency corrections up to that time). Combined DT/OT flight testing begun in late November and December 1997 has progressed with the system still exhibiting some of the performance anomalies observed during DT, which are potentially software correctable. After the OT-IIA flight testing, the system is planned to return to the ACETEF in 2QFY98 to complete the OA supporting the planned LRIP decision. While OA data collection and analysis remains incomplete, system performance and capability at the time of this writing is generally assessed to be an improvement over the AN/ALR-67E(v)2 which the ASR is intended to replace.